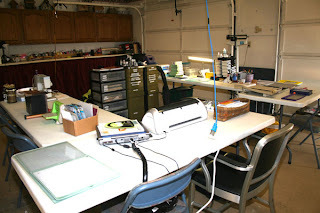 I have had several people ask to see pictures of my crafting area. I have a 30x30 finished garage that I work in with 4 tables arranged in a square. We have counters all around the sides of the garage that we used for our Soap and Candle Manufacturing business. Those still come in very handy. My computer and desk are over in the corner, but right now is not tidy, so I won't take a picture of it yet. After I do my morning chores in the house, I spend my day out in my room. I do all of our cooking and canning there too. Jon has his "toy" room attached to this room where he works on his mechanical things and parks our cars. We laugh and say if we had a bed out here and a bath room we wouldn't even need our house. But, I love being able to go in the house at night and close the door on my work area, especially when I don't get it cleaned up when I am done for the day. I have taken different shots below of the room to give you a better idea of how it looks. I'M SO ENVIOUS!!!!!! PEA GREEN WITH ENVY TOO!!!! OMGoodness, Joan! This must be the best use of a garage I have EVER seen! LOL I love the set up! Joan your work area is fabulous... I want to come and work in your house!!!LOL!!! How fun to see your space! And what a space it is!!! Room, glorious ROOM!!!! WOW ... good for you Joan!! What a great work area ... I'm sure you have spent many happy moments there and there will be a lot more to come!! How Awesome!! !